“The Secret Weapon: All of Us,” by Nicholas D. Kristof (column, Aug. 29), made my blood boil. I am a small-business owner and, yes, my clients get to the store on roads built by everyone, and we use public services paid for by everyone. Yet, none of these workers had to use their houses as collateral and none of them had to worry about paying for the health benefits of their employees, and not everyone is taking advantage of tax loopholes. This unrealistic view of the average business owner by the media drains my spirit. From Catholic Lane, we get Lane Core's understanding of the Main Rules of the Mainstream-Media Herd (thanks to ELC). If You Were a Member of the MSM, What Hillary News Would You Choose to Lead With This Week? So, with Hillary firmly embroiled in a private email account scandal, what story does AOL choose to lead its Clinton family news? That's right! Who pioneered the pantsuit in Washington and who did not pioneer the pantsuit in Washington is of utmost interest these days! Incidentally, what this does is allow America OnLine to eulogize another member of Congress, needless to say also a Democrat (in the person of Maryland Senator Barbara Mikulski, aka a "pint-sized trailblazer with a huge legacy" as well as "one of the fiercest fighters for women, families and the middle class"). So wait a minute: how about the real story? 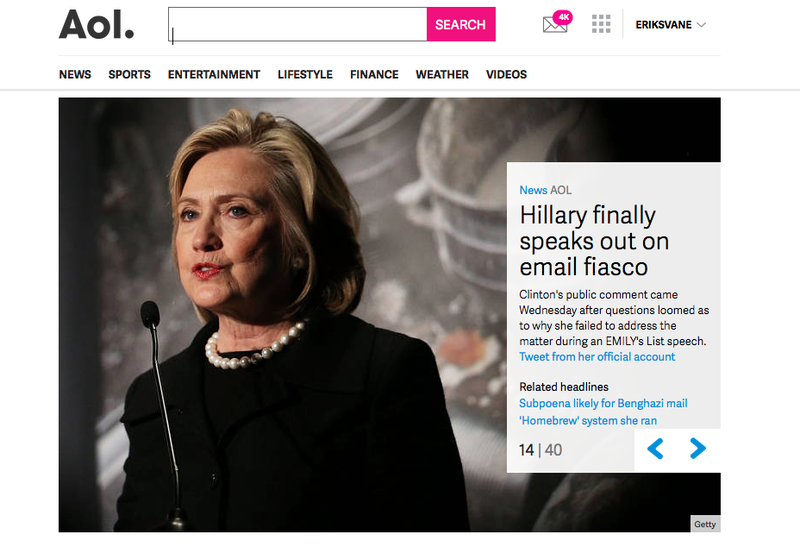 How about the former secretary of state's private email account scandal? 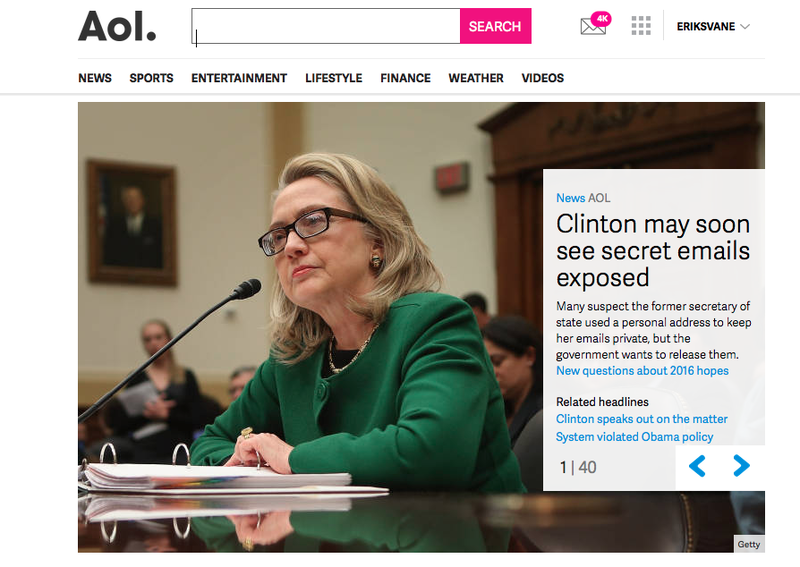 Yup, AOL does do its duty and does cover it. …the story comes in… 14th place! Update 2: perhaps someone at AOL reads No Pasarán? Or, perhaps, Instapundit? 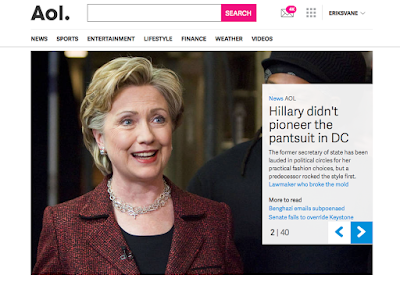 In any case, within hours of the Glenn Reynolds re-post, America OnLine effectively and suddenly put the Hillary story (the email article, not the pantsuit article) in its number 1 position. Where it remained for… a few hours, before disappearing entirely from the 40-section news department. or at least the portion attributed to conservative columnist George Will. Last September, Politifact “corrected” Will when he tweeted, “Some doctors say Ebola can be transmitted through the air by a ‘sneeze or some cough.’” His statement was later rolled up with other Ebola-related claims and deemed the biggest fib of 2014. Not that Will’s statement was very definitive. “Some doctors” could mean only a handful, but even so, Jon Greenberg of Politifact couldn’t let it stand. His rebuttal to Will was rather hard to follow as it meandered quickly into the realm of irrelevancy. Greenberg also admitted that he was unsure which doctors Will was quoting. … Besides common sense, there’s another reason to believe that Ebola could in fact be transmitted by cough and sneezes—the fact that the World Health Organization (WHO) said in October that the Ebola virus could be transmitted exactly that way, provided that the person on the receiving end has an open cut or sore. So yes, “some doctors” do make that claim and they work at the WHO. This isn’t the first time that Politifact’s “Lie of the Year” turned out not to be a lie at all. Its 2012 “Lie of the Year” was a claim made by candidate Mitt Romney that the bailed-out semi-American automaker Chrysler had plans to build a Jeep factory in China. Politifact rebuffed Romney, citing a statement from a Chrysler spokesman who declared, “Jeep has no intentions of shifting production of its Jeep models out of North America to China.” Apparently, the whole thing was debunked because a corporate spokesman denied it, which is an interesting standard of proof that I’d wager Politifact employs selectively. Then, in January of 2013, Chrysler and its parent company Fiat announced plans to open a new factory in Guangzhou, China. Which is exactly what Romney said. Just don’t accuse Politifact of having a partisan agenda. They hate that. It’s not that they consistently side with the Democrats, it’s just that the Democrats are always right. Or at least most of the time. Since Politifact started giving out “Lie of the Year” awards in 2009, it has awarded it to conservative or Republican claims four times, often for inconsequential statements, and at least twice for statements that turned out to be true. It awarded its “Lie of the Year” to liberal or Democratic claims only twice. Surprisingly, it even gave Obama’s “If you like your plan, you can keep your plan” fib its “Lie of the Year” Award in 2013. The difference is that Obama’s lie really was a big fat whopper that everyone knew to be false but repeated endlessly in order to get Obamacare passed. In any case, fact checking has gotten to be rather absurd. What was supposed to be a nonpartisan exercise in discerning the truth through a haze of competing claims has become nothing but partisan hackery. It isn’t even honest partisan hackery. It’s liberals pretending not to be liberals, which I’ve noticed they do a lot. “Fact checking” is nothing more than reliably liberal mouthpieces going to bat for the Democrats while pretending to be umpires calling balls and strikes. The American journalistic establishment, you see, claims to value objectivity. … Fact checking is arguably the most corrupt business in America, second perhaps only to personal injury lawyers. The little charade fact checkers play, in which they pretend to help readers navigate a sea of chicanery, is really getting quite tiresome.